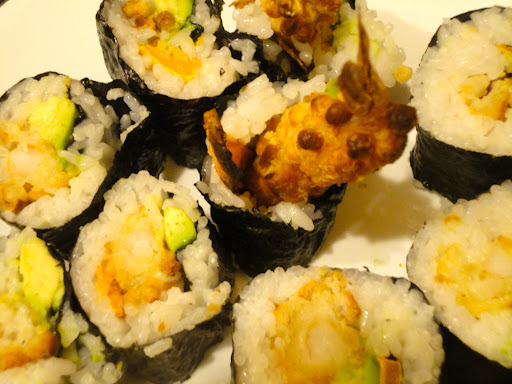 …craving sushi like crazy, it’s about time that you learn how to make it yourself! Roll out your bamboo mat, and lay down a seaweed sheet, on one end of the sheet place sliced avocado, cooked sweet potato, and coconut shrimp on top. Take half of the cooked rice, and spread it out on the seaweed sheet, leaving a small free space on the opposite end (to the avocado, sweet potato, and coconut shrimp*). Wet your palm with cold water, and flatten it out over the rice. Using the bamboo mat, roll the avocado, sweet potato, and coconut shrimp end over, at which point you can use your fingers to finish rolling. Squeeze the roll with the bamboo mat, to securely close the roll. Using a sharp, wet knife, slice the roll into pieces! This recipe should make 2 full sushi rolls. Hopefully this will satisfy you for the time being! Do you know any other easy sushi recipes to make?